Cyprian Ekwensi who has died aged 86, was often referred to as the father of the modern West African novel. More prolific than most of his contemporaries and more versatile than any other writers except Wole Soyinka. Between stints as a teacher, forester, pharmacist, broadcaster and film-maker, Ekwensi managed to publish over 40 books across literary genre, as well as radio and television scripts. "Five decades or more of writing novels, novellas, short stories, children's books, have brought me world fame but not fortune," he said. "If I were an American living in <?xml:namespace prefix = st1 ns = "urn:schemas-microsoft-com:office:smarttags" />America or Europe, I would be floating in a foam bath in my own private yatch off the coast of Florida." Ekwensi said he ranged his subjects to avoid being pigeon-holed by critics. But Ekwensi was mostly misunderstood by many critics and was denied his place among eminent African writers. While many regarded Chinua Achebe as the father of modern African novel, Ekwensi's first novel, People of the City, published four years before Achebe's Things Fall Apart, was the first work by a Nigerian author to gain international acclaim, and the first modern novel to be published in Britain. The book told the story of a young crime reporter who doubles as a bandleader in a large West African city but later realises that what he can do for his country is more important than the personal pleasures he found in city life. The Times (London) reviewer saw the novel as "a vivid picture of life in a West African city." Another British critic declared that "this novel tells more about West Africa than fifty government reports." At the same time, the Irish Government banned the novel on the grounds of indecency and obscenity. These elements of contradiction and controversy was to trail Ekwensi's later works. Of Igbo extraction, Cyprian Odiatu Duaka Ekwensi was born on September 26, 1921, in Minna, in the mainly Hausa-speaking Northern Nigeria. His earliest inspiration towards creative writing stemmed from his father, David Anadumaka, who was a famed story-teller and elephant hunter. After primary education, Ekwensi headed South West for boarding school at Government College, Ibadan, and for over five years was engrossed in Yoruba culture. He was a brilliant and highly sociable student. His active school life and multi-ethnic upbringing reflected greatly in his work. After stints at various colleges in Nigeria and Ghana, he began work as a forestry officer in 1945. This lasted for two years. Taking advantage of his wild and lonely environment, he began to write adventure short stories with forest backgrounds. Some of these were published in 1947 as Ikolo the Wrestler and Other Ibo Tales. The same year, five of his work were published in England by Lutterworth Press as part of African New Writing. Another collection of light romance stories was published in 1948 by an Onitsha publisher and many critics claimed that these stories helped to inspire the popular Onitsha Pamphlet Literature. 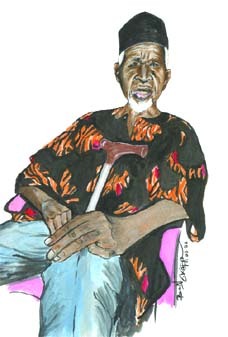 In 1949, Ekwensi began to read his short stories on the Nigerian Broadcasting Corporation (NBC) while also writing for several newspapers in Lagos. Two years later, he won a scholarship to study pharmacy at the University of London. Ekwensi said that it was while he was on the ship to England that he began to put together a manuscript. Thus, People of the City, was published in 1954 by Andrew Dakers. While in England, he worked as a pharmacy assistant and wrote and broadcast plays for the BBC. In addition, he took broadcast journalism training with the BBC. He did a voice-over for the film, Man of Africa, which in 1954 was shown at the Venice Film Festival. Ekwensi also wrote filmscripts, which included Nigeria Greets the Queen, to mark the Queen's first visit to Nigeria. Upon his return to Nigeria, Ekwensi worked his way up NBC, rising to the post of Director of Information. He also continue to write profusely. Two children novellas, The Drummer Boy and The Passport of Mallam Illa were published in 1960 and his most successful novel to date, Jagua Nana and equally successful collection of vignettes, Burning Grass, were published in 1961. Between 1961 and 1966, Ekwensi published at least one major work every year. Jagua Nana, the story of a Lagos prostitute was vehemently attacked by various religious groups for its sexually-explicit language and was banned in several schools. An application to turn the book into a film was rejected by the Nigerian parliament. But the book won Ekwensi the Dag Hammarskjold International Prize in literature in 1968. As the civil war broke out in Nigeria in 1966, Ekwensi joined the secessionist government of Biafra, becoming the chairman of the Bureau for External Publicity and an adviser to Odumegwu Ojukwu, the Biafran leader. After the war, he continued his literary and pharmaceutical career. His writings included various children books, short stories and a sequel to Jagua Nana - Jagua Nana's Daughter. He helped form the now powerful Association of Nigerian Authors and was also awarded a national honour of the Member of the Order of the Federal Republic. Lately, he has been working on his biography. He died on Sunday, November 4, 2007, and is survived by Chinwe, his wife of several years and nine children. Main picture: By Basil Okafor of The Sun Newspaper (Lagos, Nigeria). his demise still made me sad. Here was a man I admired greatly and from whom I first learnt the ropes, as it were, by reading and studying his works from my childhood. then, that it may turn out to be his last major outing, judging by his physical condition then and despite the fact that he still spoke about the future with the enthusiasm of a child! looked forward to when I would begin coaching him. It never came to pass and I am sad! these parts. His imagination was vivid and his language, candid.